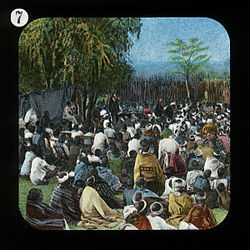 Around 1900, the London Missionary Society produced a series of glass magic lantern slides depicting the missionary efforts of David Livingstone such as this one. The London Missionary Society was a predominantly Congregationalist missionary society formed in England in 1795 at the instigation of Welsh Congregationalist minister Dr Edward Williams working with evangelical Anglicans and various nonconformists. It was largely Reformed in outlook, with Congregational missions in Oceania, Africa, and the Americas, although there were also Presbyterians (notable for their work in China), Methodists, Baptists and various other Protestants involved. It now forms part of the Council for World Mission (CWM). Ye were once Pagans, living in cruel and abominable idolatry. The servants of Jesus came from other lands, and preached His Gospel among you. Hence your knowledge of salvation. And ought ye not, as an equitable compensation for their kindness, to send messengers to the nations which are in like condition with yourselves of old, to entreat them that they turn from their dumb idol to the living God, and to wait for His Son from heaven? Verily their debtors ye are. The cession of the district of Matavai in the island of Tahiti to Captain James Wilson for the use of the missionaries. A Captain James Wilson offered to sail the missionaries to their destination unpaid. The society was able to afford the small ship Duff, of 267 tons ( bm). It could carry 18 crew members and 30 missionaries. Seven months after the crew left port from the Woolwich docks in late 1796 they arrived in Tahiti, where seventeen missionaries departed. The missionaries were then instructed to become friendly with the natives, build a mission house for sleeping and worship, and learn the native language. The missionaries faced unforeseen problems. The natives had firearms and were anxious to gain possessions from the crew. The Tahitians also had faced difficulties with diseases spread from the crews of ships that had previously docked there. The natives saw this as retribution from the gods, and they were very suspicious of the crew. Of the seventeen missionaries that arrived in Tahiti, eight soon left on the first British ship to arrive in Tahiti. When Duff returned to Britain it was immediately sent back to Tahiti with thirty more missionaries. Unfortunately this journey was disastrous. A French privateer captured Duff, landed its prisoners in Montevideo, and sold her. The expense of the journey cost The Missionary Society ten thousand pounds, which was initially devastating to the society. Gradually it recovered, however, and in 1807 was able to establish a mission in Guangzhou (Canton), China under Robert Morrison. Another missionary who served in China was John Kenneth Mackenzie. A native of Yarmouth in England, he served in Hankow and Tientsin. In September 1816 Robert Moffat (1795–1883) was commissioned in the Surrey Chapel, on the same day as John Williams. Moffat served in South Africa until 1870, accompanied by his wife Mary (1795–1870) from circa 1819. In 1817 Edward Stallybrass was sent out to Russia to start a mission among the Buryat people of Siberia. The mission received the blessing of Alexander I of Russia, but was suppressed in 1840 under his successor Nicholas I. Alongside Stallybrass worked Cornelius Rahmn of Sweden, William Swan and Robert Yuille of Scotland. In 1818, the society was renamed The London Missionary Society. In 1822, John Philip was appointed superintendent of the London Missionary Society stations in South Africa where he fought for the rights of the indigenous people. 1823 - John Williams discovered the island of Aitutaki, in Rarotonga. It is here that the missionary work was first established. In later years John Williams visited Rarotonga, taking with him two Tahitians he picked up from Tahiti. One of the Tahitians, named Papehia, was used as intermediaries to convince local chiefs to join the new gospel. 1830 – John Williams sighted the coast of Savai'i in Samoa and landed on August 24, 1830 at Sapapali'i village in search of Malietoa Vai‘inupo, a paramount chief of Samoa. John Williams was greeted by his brother Taimalelagi. Upon meeting Malietoa at a large gathering in Sapapali'i, the LMS mission was accepted and grew rapidly throughout the Samoan Islands. The eastern end of the Samoan archipelago, was the kingdom of Manu'a. The paramount chief, Tui-Manu'a embraced Christianity and Manu'a also became a LMS island kingdom. 1832 – John Williams landed at Leone Bay in what was later to become American Samoa. (Tala faasolopito o le Ekalesia Samoa) He was informed that men of their village have accepted the 'lotu' brought by an Ioane Viliamu in Savai'i; not knowing John Williams now stood before them. A monument stands before the large Siona Chapel – now CCCAS in Leone, American Samoa – in honor of John Williams. In 1839 John Williams's missionary work whilst visiting the New Hebrides came to an abrupt end, when he was killed and eaten by cannibals on the island of Erromango whilst he was preaching to them. He was traveling at the time in the Missionary ship Camden commanded by Captain Robert Clark Morgan (1798-1864). A memorial stone was erected on the island of Rarotonga in 1839 and is still there today. His widow is buried with their son, Samuel Tamatoa Williams, at the old Cedar Circle in London's Abney Park Cemetery, the name of her husband and the record of his death described first on the stone. John Williams' remains were sought by a group from Samoa and his bones were brought back to Samoa, where throngs of the LMS mission attended a funeral service attended by Samoan royalty, high-ranking chiefs and the LMS missionaries. His remains were interred at the native LMS church in Apia. A monument stands in his memory across from the Congregational Christian Church of Apia chapel. 1839–1879 – Reverend George Pratt served as a missionary in Samoa for many years, at the station at Matautu on Savai'i island. Pratt was a linguist and authored the first grammar and dictionary on the Samoan language, first published in 1862 at the Samoa Mission Press. In 1840 the medical missionary and explorer David Livingstone (1813-1873) departed for South Africa, arriving in 1841, and serving with the LMS until 1857. Moffat and Livingstone met circa 1841. In 1845 Livingstone married Robert and Mary Moffat's daughter Mary (1821-1862). 1844 – London Missionary Society established Malua Theological College at the village of Malua on Upolu to educate local men to become village clergy for the rapidly growing mission with over 250 villages and 25,000 membership. 1844 – London Missionary Society sent Samoan missionaries to surrounding islands; Rotuma, Niue, Tokelau, Ellice Islands, Papua, Vanuatu. Over 300 served in Papua alone. Eric Liddell, 1924 Olympic gold medalist in the 400 metres race, served as an LMS missionary to China. The London Missionary Society merged with the Commonwealth Missionary Society (formerly the Colonial Missionary Society) in 1966 to form the Congregational Council for World Mission (CCWM). At the formation of the United Reformed Church in 1972 it underwent another name change, becoming the Council for World Mission (Congregational and Reformed). The CWM (Congregational and Reformed) was again restructured in 1977 to create a more internationalist and global body, the Council for World Mission. The records of the London Missionary Society are held at the library of the School of Oriental and African Studies in London. ^ The LMS and the academy at Masbrough both date from the year 1795. ^ Porter, Andrew. "Founders of the London Missionary Society (act. 1795), Oxford Dictionary of National Biography". Retrieved 21 March 2017. ^ James Hay; Henry Belfrage (1831). A memoir of the Reverend Alexander Waugh: with selections from his ... correspondence, pulpit recollections, &c. ... Hamilton, Adams, & Co. p. 203. ^ Parker, Irene (1914). Dissenting academies in England: their rise and progress, and their place among the educational systems of the country. Cambridge University Press. p. 140. ISBN 978-0-521-74864-3. ^ Hoiberg, Dale H., ed. (2010). "Abdullah bin Abdul Kadir". Encyclopædia Britannica. I: A-ak Bayes (15th ed.). Chicago, Illinois: Encyclopædia Britannica Inc. p. 23. ISBN 978-1-59339-837-8. ^ Lovett, Richard (1899). The history of the London Missionary Society, 1795-1895. London : Henry Frowde. ^ Marjorie Crocombe & Ron Crocombe (1968). Works of ta'unga: records of a Polynesian traveller in the south seas, 1833-1896. University of the South Pacific. p. 19. ISBN 982-02-0232-9. ^ "Wallbridge's 'The Demerara Martyr'"
^ Charles Sylvester: The Story of the L. M. S., 1795-1895, 1895, p. 298. Retrieved 7 November 2011. Goodall, Norman (1954), 'History of the London Missionary Society 1895-1945', London: O.U.P.